Written both for veteran train travelers and those considering their first rail journey, this guide book will make any trip smoother and more enjoyable with its insightful travel trips and lots of information about how railroads operate. The author explains how individual trains are operated and offers tips on booking trips, finding the lowest fares, packing for an overnight trip, what to do on board, and whom to tip and how much. This revised fourth edition includes a new chapter about eight major railway stations, and is updated throughout with new information and photographs. 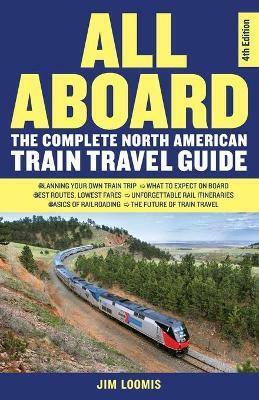 It discusses Amtrak s new locomotives and Viewliner sleeping cars, changes in rules regarding pets and bicycles on American trains, and much, much more, making it the ultimate guide to American train travel and its unique history and culture." Edition Statement 4th Fourth Edition, Fourth ed. Jim Loomis writes frequent columns about train travel for Sunday newspaper travel sections and has ridden every one of Amtrak's routes, including taking all their long-distance trains multiple times, logging nearly 200,000 miles on trains in the U.S. alone. He has also traveled across Canada on VIA Rail five times and is a member of the board of directors of the National Association of Railroad Passengers. He lives in Haiku, Hawaii.